The system for nominating candidates for the U.S. presidency looks complex, even chaotic, and it is. Ever since the 1970s when the Democratic and Republican parties began to reform the rules for selecting their presidential and vice presidential nominees, the system has been in a state of flux, with the most successful candidates being those who understand the complexities and can maneuver in and around them. But after all, that is what creative politicians do — learn the game of politics and play it hard and skillfully. Unlike the electoral college system for electing the president, the procedures for nominating presidential candidates are not spelled out in the U.S. Constitution. There were no political parties in existence at the time that the Constitution was drafted and ratified in the late 1700s. Parties developed after the government began to function, and as a consequence of the policies pursued by America's first president, George Washington. Beginning in 1796, members of the U.S. Congress who identified with one of the political parties of the time met informally to agree on their party's presidential and vice presidential nominees. Known as "King Caucus," this system for selecting party candidates continued for almost 30 years. It broke down in 1824, a victim of the decentralization of power within the political parties that accompanied the westward expansion of the United States. National nominating conventions replaced King Caucus. In 1831, a small and minor party, the Anti-Masons, met in a saloon in the city of Baltimore, Maryland, to choose candidates and a platform (a declaration of the principles and policies adopted by a political party or candidate) on which they would run. The next year, the Democrats met in the same saloon to select their nominees. Since then, the major parties and most minor parties have held national nominating conventions, attended by state delegates, to choose their presidential and vice presidential candidates and to agree on their policy positions. Throughout the 19th and into the 20th century, the nominating conventions were controlled by state party leaders who used their influence to handpick their state's delegates and make sure that they voted "correctly" at the convention. The dominance of these party leaders ultimately became an issue within the parties. Those who did not like having entrenched "bosses" dictating the nominees supported reforms that permitted partisans within the states to select convention delegates in "primary" elections — elections that were scheduled before the general election. By 1916, more than half the states held presidential primaries. The movement to encourage more people who considered themselves partisans to participate in their party's presidential selection process was short-lived, however. Following the end of World War I, party leaders, who saw the primaries as a threat to their power, persuaded state legislatures to abolish them on the grounds that they were expensive and that relatively few people participated in them. Some potential candidates had also refused to enter the primaries because they already had the support of state party leaders and did not want to risk losing that support in a popular vote. Besides, in some states the presidential preference vote was only advisory; convention delegates were selected in another manner. 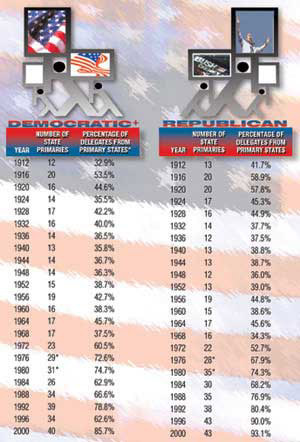 By 1936, only a dozen states continued to hold presidential primaries. But democratizing pressures reemerged after World War II, aided by developments in communications technology. The advent of television provided a medium through which people could now see and hear the political campaigns in their own living rooms. Candidates could use television exposure to demonstrate their charismatic popularity and potential electability. As candidates, Dwight Eisenhower, John Kennedy, and Richard Nixon all entered multiple state primaries, at considerable cost and effort, to prove to their party that a general, a Catholic, and a once-defeated presidential candidate could win a general election. And they were successful. Each of them subsequently received his party's nomination and was elected president. In addition, the Vietnam War, which began in the mid-1960s and continued into the 1970s, engendered internal divisions within the Democratic Party, which, in turn, created pressures for further reform. The catalyst was the 1968 Democratic nominating process. An anti-war movement split the Democratic Party and produced violent demonstrations in the streets of Chicago, the city that hosted the party's convention that year. Despite the agitation that accompanied its meeting, the party selected Vice President Hubert Humphrey, who had decided not to enter any Democratic primaries and thereby become a target of the anti-war protests. + Includes party leaders and elected officials chosen from primary states. * Does not include Vermont, which holds nonbinding presidential preference votes but chooses delegates in state caucuses and conventions. Sources: For 1912-1964, F. Christopher Arterton, "Campaign Organizations Face the Mass Media in the 1976 Presidential Nomination Process" (paper delivered at the Annual Meeting of the American Political Science Association, Washington, D.C., September 1-4, 1977); for 1968-1976, Austin Ranney, Participation in American Presidential Nominations, 1976 (Washington, D.C.: American Enterprise Institute, 1977), table 1, 6. The figures for 1980 were compiled by Austin Ranney from materials distributed by the Democratic National Committee and the Republican National Committee. The figures for elections since 1980 were compiled by the author from data supplied by the Democratic and Republican National Committees and the Federal Election Commission. In an attempt to unify a divided party, the Democratic convention, after it nominated Humphrey, agreed to appoint a committee to reexamine the party's presidential nomination process, with the twin goals of encouraging greater party participation in the selection of a Democratic nominee and more equitable representation of the party at its nominating convention. The reforms adopted by the party began a process by which both major parties have democratized the way they select their nominees. The major reforms that the Democrats instituted have encouraged most of the states, which make the election laws for their residents, to hold primary elections. As currently constituted, a primary is an election among supporters of the same party to choose that party's nominees to run in the general election. Depending on the laws of the state, voters may cast ballots for a party's presidential candidates themselves, or indirectly for convention delegates who are "pledged" to those candidates. The only other option that states may have under the current system is to hold a multistaged caucus/convention process in which partisans who live within a relatively small geographic area — a local precinct — get together and vote for delegates who are pledged to support specific candidates. Those delegates, in turn, represent their precinct at a county convention, which chooses delegates to attend the state convention. And the delegates to the state convention select delegates to represent the state at the national convention. Although this system involves several months, the candidate preferences are essentially determined in the first round of voting. 1. Caucuses are held in more than 2000 precincts across the state of Iowa to choose more than 1,500 delegates to 99 county conventions. 2. Conventions are held in counties to choose 3,000 delegates to five congressional district conventions. 3. Conventions are held in congressional districts to elect district-level delegates to national party conventions. The same delegates also attend the state convention. 4. State conventions elect at-large delegates to the national party convention. Democrats also select their state party and elected official delegates. Democrats: Only registered Democrats who live in the precinct and are eligible to vote may participate. Attendees are asked to join preference groups for candidates. To be viable, a group must consist of at least 15 percent of those present. Nonviable groups are dissolved, and those who were members of them may join viable groups. Much lobbying occurs at this stage of the meeting. Delegates are allocated to candidates strictly on the basis of the group's proportion to the caucus as a whole. Republicans: Attendees, who must be eligible to vote but do not have to be registered as Republicans, cast a presidential preference vote by secret ballot. The votes are tabulated on a statewide basis. Delegates to the county convention are then selected by whatever method the caucus chooses, either by direct election (winner-take-all) or proportionally on the basis of a straw vote. The actual size of any state's delegation to the national nominating convention is calculated on the basis of a formula established by each party that includes such considerations as the state's population, its past support for the party's national candidates, and the number of elected officials and party leaders currently serving in public office. The allocation formula that the Democrats use results in national conventions that have about twice as many delegates as those of the Republicans. The U.S. Constitution gives the states the authority to make their own election laws subject to the rules and qualifications that Congress may establish. Although states are free to determine the dates on which their primary and caucus elections may be held, they also have an incentive to conduct their nomination contests in accordance with party rules, since the U.S. Supreme Court has determined that the parties have a right to describe and enforce their own rules for those attending the national conventions. Thus, states that permit selection of party convention delegates in a manner that does not conform to party rules may find their delegates challenged when they get to the national party conventions, or they may find the size of the delegation reduced by the party for violating its rules. Today, more than 80 percent of the delegates who attend their party's national convention are chosen in primary elections that are open to all registered or self-identified Democrats or Republicans. The Democratic Party has imposed a set of national rules on all its state affiliates; the Republican Party has not. The Democratic rules, in effect, require states to hold their presidential nomination contests between the first Tuesday of February and the second Tuesday in June in a presidential election year. The smaller states of Iowa and New Hampshire are given official exemptions to vote earlier because of their tradition of holding the first caucus and primary, respectively. The Democrats — in order to enhance the representation of minorities that may be concentrated in communities within the state — also require that 75 percent of a state's delegation be elected in districts that are no larger than a congressional district. Moreover, the number of delegates who are pledged to support specific candidates is determined in proportion to the vote they or their candidates receive. The Democrats also have other delegates — party leaders and elected officials — who are not under obligation to support particular candidates even though those candidates may have won primaries in their states. Finally, the Democrats require that state delegations be equally divided between men and women. • More and more states have moved their primaries and caucuses toward the beginning of the electoral process in order to exercise more influence over the selection of the nominees, encourage the candidates to address the needs and interests of the state, and get their campaigns to spend money in them. This is known as "front-loading." • In a practice known as "regionalization," states have cooperated with one another to hold their primaries and caucuses on the same date to maximize the influence of a region. Both of these trends have forced candidates to begin their campaigns earlier to gain a foothold in the states that hold the initial contests. Candidates also have had to depend increasingly on the mass media, particularly radio and television, and on the endorsements of state party leaders to help them reach voters in the multiple states that may be conducting their primaries on the same day. The front-loading and the regionalization of the presidential primary nomination process has benefited nationally recognized candidates, such as incumbent presidents, the governors of major states, and U.S. senators and representatives who have access to money, media, and organizational support. Consider the preliminaries leading up to the 2004 Democratic presidential nomination, for example. Eight Democratic candidates had raised approximately $25 million and had spent $7 million by March 31, 2003, more than 10 months before the first scheduled caucus or primary. Of these candidates, those who hold seats in the Congress raised the most, hired the best-known political consultants, and began to build the largest campaign organizations. The short time frame of the primary process works against those who need primaries and caucuses to be stepping-stones to the nomination, such as Jimmy Carter in 1976 and John McCain in 2000. The continuing changes in the nomination process affect all the candidates. Even incumbent presidents cannot take their re-nomination for granted. In 1992, George H.W. Bush suffered some embarrassing defeats in the primaries at the hands of conservative talk show pundit and newspaper columnist Pat Buchanan. In contrast, Bill Clinton in 1996 raised large sums of money early on to discourage a political opponent within his own party from challenging him. Clinton used this money to pursue a strategy of mounting a media-oriented, electoral campaign that extended from the beginning of the caucuses and primaries through the national election. Reforms in the presidential nominating process have clearly enlarged the base of public participation. In 1968, before the recent changes in the process, only 12 million people voted in primaries, approximately 11 percent of the voting-age population. In 2000, approximately 35 million participated, about 15 percent of the electorate. In the run-up to the 2000 presidential election, more than 20 million voted in contests between George W. Bush and his Republican opponents, and about 15 million voted in the Democratic contests between Vice President Al Gore and his principal opponent, former Senator Bill Bradley. In addition to increasing public participation, the modern nominating process has expanded the representation of the groups comprising each party's electoral coalition. Although demographic representation — in the sense of race and gender — has broadened among the parties' delegates to the nominating conventions, ideological representation has not. The reason for this is that those who have higher participation rates in the nomination process tend to be party activists who are more ideological than the average rank-and-file party identifiers. Thus, the delegates at Republican conventions tend to be more conservative and the Democratic delegates more liberal than their respective electorates. As noted, the reforms have also weakened the power of state party leaders and provided incentives for those seeking their party's nomination to make broad-based public appeals. These appeals have strengthened the tie between the candidates and their core base of supporters and have encouraged those who win office to redeem their campaign promises. George W. Bush, in his first year in office, directed his energies toward achieving his principal campaign policy goals of tax relief, educational reform, and greater military preparedness, policy initiatives oriented toward his conservative political base. Although many of the nomination reforms have contributed to a democratization of the nomination process, anomalies still exist. Those who participate in the primary elections tend to be better educated, to have higher incomes, and to be older than the average Republican and Democratic voter. In addition, as always, those who contribute money to the candidates or for their causes tend to be in the higher socioeconomic brackets. Inevitably, they gain a more powerful voice in the election outcome as a result. Finally, the public and contentious nomination process produces factions within the parties. The more competitive the quest for the nomination, the more likely that these divisions will develop to the point where they must be overcome quickly if a party is to mount a successful presidential campaign for its nominee. Another consequence of the changes in the presidential nomination process has been the decreasing importance of the party's national nominating convention. Today, the presidential nominee is effectively determined by the voters relatively early in the nomination process. That nominee, in turn, usually indicates his choice for a vice presidential candidate before the convention meets. The winning candidate also controls the drafting of a party platform. Why, then, should the American people spend time in front of a television set watching the nominating conventions? The fact of the matter is that many people do not do so. Convention viewership has declined in recent years, as have the number of hours that the major broadcast networks air the proceedings during prime viewing hours. Surveys conducted by research organizations during the summer of 2000, when both parties held their nominating conventions, found that about half the television audience did not tune in to either of them. Despite the decline in the viewing audience, the conventions still receive attention on news shows and in newspapers. The same surveys indicated that in 2000, public awareness increased during and after the conventions, as did knowledge of the candidates and their policies. Thus, the conventions did serve to inform the voters, shore up support and build enthusiasm among partisans for their party's nominees, and focus the attention of the country on the forthcoming general election. The presidential nominating process is not perfect, but in recent decades it has enhanced participation, improved demographic representation, and strengthened the tie between the average partisan and the candidates. As constituted, the process gives advantage to candidates who are better known, can raise more money, have the most effective campaign organizations, and generate the most enthusiasm among the voters early in the presidential primary season. Stephen J. Wayne is a professor of government at Georgetown University in Washington, D.C., and the author of the book, The Road to The White House 2004 (Thomson/Wadsworth, 2004).